NEW YORK - Bill Moyers walks with Dora the Explorer and paper company branch manager David Brent. What puts this veteran journalist in the company of a cartoon moppet on Nickelodeon or the fabulous clod from the BBC comedy "The Office"? Each is among this year's winners of a George Foster Peabody Award -- along with CBS News' "60 Minutes," the science series "NOVA," a public-radio series on classical music, the Showtime film "Soldier's Girl," a Web site (Transom.org), a war story told in animation from Japan, five local TV news departments and 15 other recipients. The Peabodys, which honor outstanding achievement from around the world in television, radio and emerging media, are administered by the Grady College of Journalism and Mass Communication at the University of Georgia, and have been since 1941. This year's winners, chosen by a board of 15 judges from diverse backgrounds, were announced in March and received their Peabody medallions Monday at a luncheon at Manhattan's Waldorf-Astoria Hotel, with NBC News' Katie Couric (herself a past recipient) master of ceremonies. With no fixed categories or even annual quota of Peabody winners, no Peabody is "better" than any other. But if there is a greater-among-equals this year, it would surely be the Peabody bestowed upon Moyers, capping a three-decade career in TV journalism with his current venture, the public affairs magazine "Now with Bill Moyers." "I am a journalist but I am also a pilgrim," said Moyers during a recent chat, quoting himself from a just-published collection of commentaries and speeches, "Moyers on America: A Journalist and His Times." Moyers' compound self-assessment helps explain his range of interests. So does his resume, which includes government service (he was an aide to fellow Texan Lyndon Johnson) and a divinity degree (he is an ordained Baptist minister). "The search for spiritual meaning is as real as the search by people for material well-being," he said. "Just as we need to understand how banks work, we need to understand how beliefs play out in the lives of individuals." 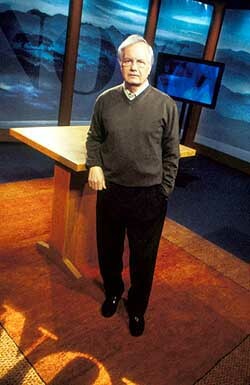 In his reporting, interviews and analysis, Moyers has demonstrated that ideas have power and urgency. They, not just events, must be part of the picture. Moyers, who turns 70 in June, recently announced that he would leave "Now" after the November elections. His co-host, David Brancaccio, will take over. His next project: Writing a long-planned book about his years with President Johnson. With this year's Peabody -- his 10th -- Moyers is cited for a career's worth of "high-quality, informative and innovative" programming including "A Walk Through the 20th Century," "The Power of Myth with Joseph Campbell," and last year's "Becoming American: The Chinese Experience," as well as other documentaries on such far-flung issues as campaign corruption, drug addiction and modern dance. "He has often tackled topics that other people shied away from," says Horace Newcomb, director of the Peabody program. "He is careful in his analysis and -- another distinctive aspect of his work -- he gives people time to talk." Displaying what's been called "a soft, probing style," Moyers investigates the world from the eye of the storm. His is the sort of calm, reasoned perspective that has never been needed more from the media because, increasingly, it's the media that call the shots on what we know. "This is a media environment we live in," Moyers said. "The media is our habitat." Unfortunately, fewer and bigger companies lay claim to our media habitat. Moyers has been a lonely but defiant voice alerting citizens to the growing control of media conglomerates. The noose drew a bit tighter with the recent marriage of Universal Studios and NBC (part of the vast General Electric empire). The NBC Universal slogan is "Imagine the Possibilities." Moyers doesn't have to imagine. He has long called attention to the impact of big media on the democratic process and on news organizations that report on it. And although he has secured a large measure of independence by raising funds to finance his own production company, Moyers worries for his journalist brethren, including those at NBC News and CBS News, where he has worked in the past. "On the whole," he said, "journalists today work for news divisions that are owned by big corporations that have business with the government and want to please the government." The result increasingly is what he terms "a cartel of corporations and political powers that determines what is heard, seen and read." For Moyers, these are possibilities that every citizen should imagine, before it's too late.